Part One in the brand new series from Holly Hepburn! 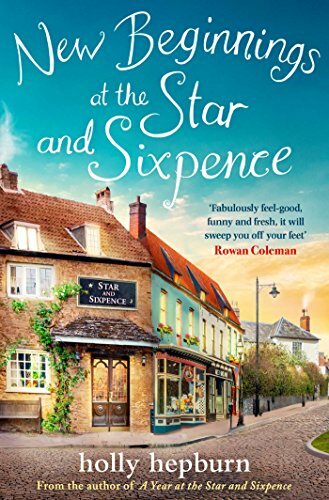 Review: This is the first part in a new ebook series about the Star and Sixpence Inn, its owners and the villagers of Little Monkham, where the pub sits by the village green. I very much enjoyed the original stories about the inn and was delighted to find that Holly Hepburn had written a further series that takes up more or less where the other one finished. 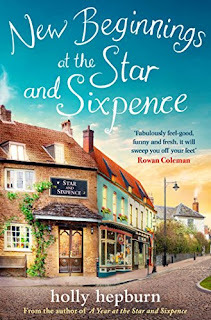 In this first part of the new series, we catch up with what has been happening in the lives of the owners of the Star and Sixpence, sisters Nessie and Sam Chapman. Nessie has moved out to live next door with Owen, the village blacksmith and his son, Luke, but is still very much involved with running of the pub. Sam is once more single, boyfriend Joss having left the area altogether. Other inhabitants of the village are very much the same as when we left them at the end of the last series. However, the village is buzzing with excitement over the imminent arrival of a new Michelin starred Spanish chef, Gabe Santiago, who is going to be producing some of his delicious cuisine at the inn. Young and handsome Gabe is quite an attraction for the ladies of the village, but can Sam remain immune to his charms? In addition to all this, a stranger walks into the inn with a claim that rocks the girls' lives. It was lovely to return to Little Monkham and find out how things were progressing with everyone. As usual, Holly's skilful writing transported me to this lovely little village clothed in autumnal colours. You can almost imagine opening the door to the inn and walking into the welcoming warmth on a chilly evening. There are also some pretty mouthwatering dishes being prepared in the kitchen in this story; yet another reason for wishing it was all real. I'm already looking forward to the next story in the series, which I'll be starting to read as soon as it lands on my Kindle.